Yesterday my cross-country navigation training began! After 3 hours of ground briefing on Thursday, John asked me to have at least 2 flights planned so that we could choose either, weather depending. Following Thursday’s nav briefing I planned the bare bones of a YSBK-YCNK-YSBK (Bankstown-Cessnock-Bankstown) flight, then arriving at the Club early yesterday morning I put together same for a YSBK-YGLB-YSBK (Bankstown-Goulburn-Bankstown) flight. For those unfamiliar with geography around Sydney, the YSBK-YCNK-YSBK flight gives you a northerly coastal flying route option, while YSBK-YGLB-YSBK gives you a south-western inland option. It took me a fair while to put these 2 plans together, and I was under the hammer because we needed to be ready for the off by 1.30pm. 12.30pm rolled around and I hadn’t even looked at the area forecasts for each of the 2 routes nor done my winds, headings and estimated times for either of the plans. Fortunately I was able to do this fairly quickly, and I opted for the Cessnock option (a good, short introductory nav flight anyway) as the forecast clouds around the inland slopes and ranges didn’t look too hot. This won’t be earth-shatteringly surprising for experienced aviators, but a good flight plan takes time to put together. Certainly at my stage and level of experience, it’s a matter of hours. It’s not something to be rushed. Time taken to plan a good flight, and to get real familiar with the map routes, is time well-spent. 1.30pm rolled around, John was back from his last ride and I hadn’t checked out my aircraft yet! OK, I wasn’t massively behind – only about 15 minutes or so – but it did give me added pressure to get through it all and get going. To be fair, it was also a slightly artificial situation in that I’d had to plan two flights prior to departure time. I wasn’t in anyway underprepared in terms of lack of application – I’d been at the club since 9am and I’d been up late doing flight planning the night before, having only had the nav briefing the previous day – but the pressure was indeed on. I learned a couple of things out of this. Try as hard as you can – without compromising the quality of the pre-flight planning process – to be ready to go on the dot of planned departure time. The more time you have up your sleeve, the less rushed you feel. And, the earlier you’re ready to go, the better the chance you have for avoiding unfavourable weather that might affect your flight. You can have most of your flight plan completed well in advance of your flight. Waypoints, lowest safe altitudes, magnetic tracks, ideal altitudes, distances, radio frequencies and nav aids, aerodrome details, all of these can be done early and can then form the “template” for your proposed and future flights. On the day of flight, you can then take the flight plan, get your weather details and relatively quickly make your altitude decisions, wind, heading, groundspeed and estimated time interval (ETI) calculations, your fuel calculations, last light, estimated times of departure and arrival and of course your weight and balance and takeoff/landing calculations and checks. My ride was SFA (Sierra Foxtrot Alpha), a new aircraft for me and in fact it’s a Piper Archer – basically a somewhat more powerful version of the Piper Warrior I’m now used to flying. It was only due to my original aircraft being in unscheduled maintenance that this eventuated. But I jumped at the opportunity to fly the Archer! It’s a more powerful and slightly faster version of the Warrior, while being basically the same plane – so it was pretty painless to have to get my head around this as we started up and taxied. I’ll be doing some nav flights on the Warriors as well, but for later navs and my own cross-country flights the Archer will be my chariot of choice. Fuelled up, started up and then one of the ear pads fell off my headset! John took over and taxied while I got myself sorted out, but it took me 2 minutes of fart-arsing around and unnecessary stress to fix my headset, get it on my head and resume control of the aircraft. It’s only the 2nd time this has happened to me in nearly 40 hours of flying – evidently the earpads are made for easy replacement and can come off easily – but it’s enough for a little gem of practical learning for me. While getting organised for flight, check the earpads on my headset to make sure they’re in place, and don’t put the headset on the floor of the aircraft – the earpads can get bumped loose. Run-up and pre-takeoff checks and departure and emergency briefs done, we had a brief wait and then were cleared for takeoff on 11L for a crosswind departure. Up and left towards Parramatta and we were away, me instantly feeling the additional grunt that the Archer’s engine adds to the aircraft’s performance. Getting away at 2:25pm, we were over Parramatta at 2:28 and then heading up the northbound lane of entry to Patonga, noting key landmarks on the route including Parramatta CBD, the M2/Pennant Hills Road interchange and Pennant Hills, the Sydney Adventist Hospital and Hornsby CBD. Over these and then we were up over the hills and gorges tracking towards the Hawkesbury area, arriving over Patonga at 2:38. Turning left onto a heading of 333 degrees at Patonga, we headed direct for Mt McQuoid, which is equipped with an NDB (Non-Directional Beacon) which makes it very easy to track inbound. McQuoid reached at 2:53, we then turned right onto 018 degrees for Cessnock. Pretty soon we could see the greenery of the Hunter Valley ahead, and all of a sudden Cessnock Aerodrome in view (pretty good visibility yesterday). Entering the Cessnock area and making the necessary radio calls on the Cessnock CTAF (Common Traffic Advisory Frequency), we were in the Cessnock circuit and down for a quick touch-and-go, with arrival Cessnock at 3:08. Not wanting to hang around due possible rain south of Sydney on our return, we headed straight out at turned left on 161 degrees for Warnervale Aerodrome. Overflying Warnervale at 3:25, we then turned right for Brooklyn Bridge. Achieving Brooklyn at 3:38, we then joined the southbound lane of entry and engaged in what John calls “map crawling” – that is, following a series of closely located landmarks on the ground rather than being guided primarily by the flight plan. So, southbound we tracked over Brooklyn, the Berowra strobe (according to John, he’d never seen the strobe as clearly as we saw it yesterday! ), the Galston Sub Station, the South Dural tanks and strobe (ditto comment from John), the M2/M7 interchange and then the familiarity of Prospect Reservoir. I don’t have it recorded exactly what time we arrived Prospect, but it would have been around 3:51, and I know we landed at 3:55, so total flight time was just 1 hour and 30 minutes, about average for the YSBK-YCNK-YSBK flight apparently. Conditions were pretty much ideal, apart from the last 5 minutes when the southerly wind in advance of rain was getting seriously up and I made a crosswind landing with just 1 stage of flap. John felt that I’d handled the first flight very well. He flew most of the outbound leg while I navigated, then I made the Cessnock landing and take-off and flew the return leg as well as navigating. I’d not had to worry about course error too much (it was only a short trip), the ride was pretty smooth so no distracting bumps, and we didn’t have to dodge any weather. But I suppose that’s ideal for the first nav flight. I know it will get more challenging. I can certainly now attest from personal experience the old navigation maximum about “staying ahead of the aeroplane”! Preferably by 15 or 20 minutes at all times. Can’t wait for my next nav. My newly qualified Private Pilot blog friend Flying Ninja told me recently that his experience training for his PPL was a mixture of fantastic highs and serious lows. I’ve come today – in a good way! – to realise the truth of his words. Today’s flight training – 2 lessons, in spite of crappy weather – was a just a sweet little bit of awesome. On the negative side, today’s pre-solo checkride did not happen. The weather has been dodgy for 3 or 4 days now (and is expected to remain so until at least Tuesday next week). Today was broken cloud with bottoms of 2000 to 2500 feet, which in itself would not have ruled out a possible solo, but there was just enough crosswind – about 10 knots – for my instructors to rule it out for today. I’d more or less expected weather to step in today, so I wasn’t that perturbed. The weather will improve, John thinks I’m ready to solo and it’s just a matter of finding the right day (hopefully next week). Fortunately, there’s still a heap of other things we can knock off while waiting for the solo, including – started today, as I’ll relate – basic instrument flying. Right now I’m pretty sanguine about the solo situation. I’m flying nearly every day at the moment, hopefully – surely! – an opportunity will arise in the next few days? On the hugely positive side, today was a day where almost everything just worked out well – no, what I should say is, I did almost everything well. So much so that after today’s 2nd lesson, not only did I feel a huge surge of satisfaction and confidence, but my instructor clearly did too. Afterwards in the clubhouse he came over to me expressly to shake my hand and express how well I’d done today. Praise indeed, and music to my ears. John’s not a hard man, but he is a professional flying instructor and he wants me to learn to a high standard – as he said yesterday, not just to learn to fly, but to learn to be a pilot. He is not miserly with praise, but nor is he lavish with it, so when you get some, you know you’ve done well. So after today, details of which I’ll relate below, I felt an injection of confidence that, in addition to John’s assessment, makes me personally feel ready for my solo. At the end of yesterday, I did not feel ready to solo. Almost, but not quite. Today, I feel ready. So. Today I was back in November Foxtrot Romeo (NFR), in which (coincidentally) I did my first hour on circuits. I feel so fond of NFR after today that I felt bound to photograph her this afternoon when I closed her out. This morning was quite dark, with cloud bottoms at 2100 feet, no good for the 2nd lesson on stalls that we still want to get done in the training area but still perfectly OK for circuits. With the maxim that “you can never do enough circuits”, we hit the runup bay for runway 11 right and ran through our run-up and pre-flight checks, only to be informed by the tower that there would be a 10-minute delay and we were advised to position ourselves within sight of the tower and shut down. Which we did. For no clear reason, as the circuit only appeared to have 2 or 3 aircraft in it at the time, but after 10 minutes a wave from the tower got us back onto the radio, to hear that the aircraft ahead of us was cleared for the circuit and we were cleared for startup. Another few minutes and we were lining up and away. Unfortunately the crosswind this morning was not strong enough to qualify technically as a crosswind lesson, but it was enough that on takeoff and landing I had to crab the nose of the aircraft a good 10 degrees to my right to maintain course and not get blown over onto runway 11 centre. Particularly for my landings, this was a good challenge, as I dealt with it much better than one of my earlier circuit lessons which entailed mild crosswind. So score a few marks for that. Not much else remarkable about the lesson itself. 5 or 6 circuits – with plenty of traffic, requiring me to slow down even from late upwind and onto my crosswind and downwind legs. But 2 of my landings scored a “7.5/10” from John – by far the best so far – and they felt fantastic. Alignment lovely all the way down. Sufficient use of pedal to stay in line (though I could do more still). Good control of airspeed around 70 knots right over the airport fence and down to 65 then 60 on the runway threshold. And that lovely chirp sound as the tires gently kiss the runway – I got them! Several times! It wasn’t just chance, my best landings are just getting better. John remarked afterwards that he’d actually enjoyed that lesson. Lovely feedback. I’m sure I will do many poorer landings in my flying career, but I now can truly say and claim that I’m getting that final landing flare sorted out. With no chance of a solo checkride this afternoon, John decided – with wholehearted endorsement from me – that we’ll plough ahead with other lessons that we can do straight away while we wait to get the first solo done. So, today I had my first experience of instrument flying. And I’m happy to say that – by either luck or some natural skill, or a bit of both – I did very well indeed. After 10 hours on the circuits it was nice to get on a different runway (11 left for arrivals/departures) and out into the training area. Taking off and turning left, we made for Parramatta while climbing to 1500 feet. While we were doing this, John directed me to keep my eyes on my cockpit instruments to get an initial “feel” for flying the aircraft on instruments only. My primary reference was my attitude indicator (angle of the aircraft’s nose above or below the horizon) with constant reference also to airspeed indicator and altimeter, and also to my other instruments and my tachometer. After five minutes of this, out came the hood! This slips over your head and is like a visor that blocks your view straight outside but lets you look at your instruments. And for the next 40 minutes I wore that hood and flew NFR entirely by reference to my flight instruments, following John’s directions to climb, descend, turn, maintain directed headings and on 3 occasions do a 180-degree level turn. Apparently during the Private Pilot License training you must have 2 hours of “Basic Instrument Flying”. This, apparently, is intended to try to give you some sort of fighting chance of surviving if you ever find yourself trapped in real IMC conditions – though as a VFR pilot this should theoretically never happen. Apparently the statistics say that non-instrument rated pilots survive for an average of just 90 seconds (or 147 seconds according to a CASA publication I saw last year) in cloud. So it’s a pretty serious deal. At the very least, it’s intended to set you up to attempt to fly out of cloud by being able to execute a level 180-degree turn and go back the way you came. Everything you read about instrument flying is true. Your senses can have you absolutely convinced that you’re flying straight and level when in fact you’re in a 10 degree (or worse) bank. As happened to me today. Or when you’re in a far more dangerous flight attitude. So the discipline is simple, if extremely challenging, as I can now relate from personal experience: you have to ignore what your inner ear tells you and trust and fly to your instruments. 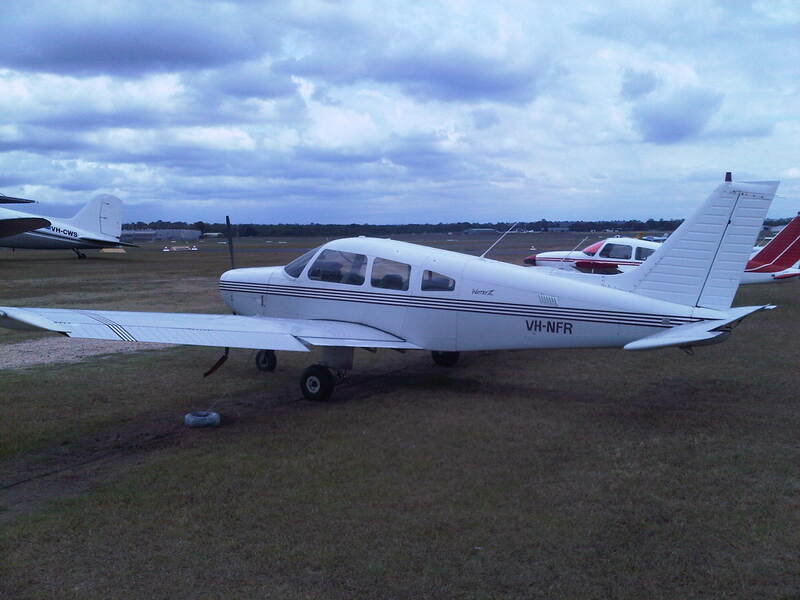 On the way back I flew “blind” as far as Warwick Farm Racecourse, then took off the hood and executed an extremely satisfying flapless landing on runway 11 left – of similar quality to my best landings from this morning – followed by 2 left-hand circuits with similar results. And I finally got the picture of what to do on my landing rolls. On the landing roll, don’t apply the brakes straight away! Use your feet to align the nose of the aircraft with the runway centreline, and then start to smoothly apply brake after everything’s under control. Don’t take an early exit off the runway if you’re still rolling too fast, be patient and take the next one. I don’t exactly know what kind of mental block I had around this one – subconsciously I was obviously feeling the need to throw out the anchor as soon as the aircraft was on the ground after landing. But funnily enough I needed to learn this rather obvious but of landing technique all over again. I don’t think I’ll forget it this time. So all in all, an enormous amount of achievement, satisfaction and positive learning coming out of today. I may not have soloed, but I’m ready for it when it happens, and I’ve proven to myself that I can land like a real pilot. Maybe I’ll become one yet. Joe Clark is a blog friend and a very experienced pilot and flying instructor in Florida, who’s kind enough to take an interest in my blog and in my flying. His feedback on a recent post of mine is worth a read.